As I walked down the slippery steel steps from the easyJet plane at Porto Airport my first impression of Portugal was not great. A bit warmer than Gatwick, where there was a sprinkling of snow on the ground, but considerably wetter. 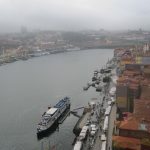 The plan was to spend two nights in Porto, with a full day exploring the city and pick up the car the following morning to see more of the country, taking in some good scenery, the coast, and as usual, a couple of car museums. 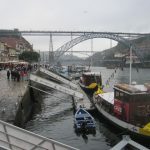 Porto, or Oporto, as it is called in English, is Portugal’s second city, situated on the Atlantic coast about 190 miles north of Lisbon and also on the mouth of the Douro river, which is the area of the port wine producers. 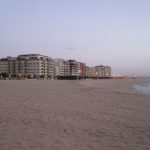 The city is famed for its architecture and spectacular riverfront scenery but not for cheap hotels, so I had chosen one about 1½ miles from the city centre. It was about 1.00pm by the time I left the airport, and the 10-mile Metro journey from the airport into the city was probably worst public transport experience I have had. The carriage was full when I got on, and over the next fourteen stops people forced their way in at every station and no one got off. The people I was crushed between were friendly and gave me advice about where to alight, which I was very relieved to do when the time came. The scene when I emerged from the Metro was somewhat depressing, an inner-city landscape which seemed to be subjected to unrelenting drizzle rather than the warm sunshine I had envisioned when planning the trip. After a snack in a little café I trudged along to my hotel through streets almost devoid of people and traffic, even though it was mid Friday afternoon. Once booked into the hotel I set off to walk through the rain to the centre. The streets were lined with a hotch-potch of terraced buildings of wildly varying character, size and condition, ranging from smart shops and car showrooms to derelict. Most of the streets were one-way, with a number of tunnels under junctions which were clearly a legacy of a massive road improvement programme in years gone by. 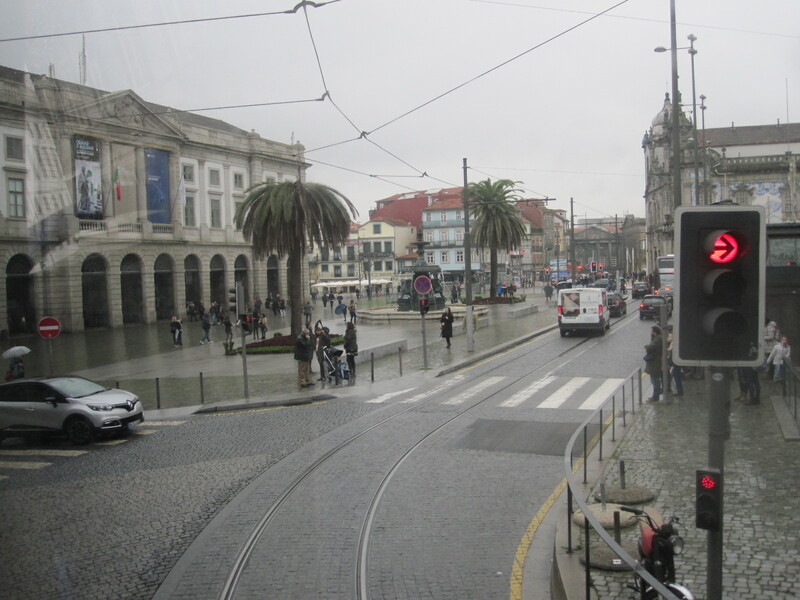 Porto actually has quite an impressive road system for a city of its size. It was downhill all the way, as the centre is at river level, and the street suddenly opened up into a small square with a restaurant facing on to it. By now I had walked over a mile and was wet enough, so decided to have a meal and slog back up the hill to the hotel. The next morning it was more of the same but a bit worse, with somewhat heavier rain. This was my day for looking round the city, so I retraced my route of the previous day until it brought me to a wide open paved area with trees in front of an impressive building called the Camaro Municipal (Town Hall). At far end of the open space I could see a double decker bus which looked remarkably like the tour bus on a leaflet that the man in the hotel had given me, and at this point I decided to become an ordinary tourist and take the coward’s way out. The bus was to depart very shortly and the driver said the tour would take 1½ hours, by which time I hoped the rain would have stopped. According to the notice the commentary was available in 16 languages, and as I only spoke 2½ of them I thought about asking for a discount, but it would probably be a waste of time. There were only two people on the top deck, the front half of which was under cover, so I settled down in a seat with a good view and stuffed the phone buds into my ears. People under 20 seem to have these things permanently in place nowadays, but I could not make them stay in for more than about 30 seconds and it became a constant struggle. 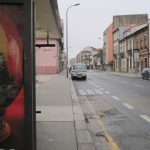 For the first half hour there was plenty of time to look at the sights because the bus crawled through the traffic at a snail’s pace until it headed along the Avenue Boavista to the coast at the western end of the city. It then turned south east to follow the long sea front road back towards the centre. Everything was going smoothly until the bus stopped and the driver told us we had to transfer to another identical one that was standing in front. 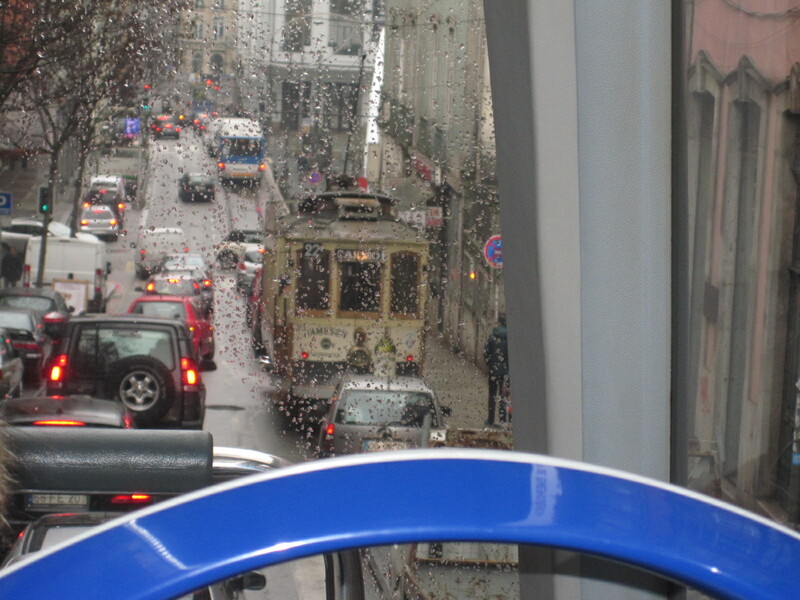 By now it was raining hard and the new bus was already well-occupied with the covered top deck full and the windows of the lower deck steamed up. 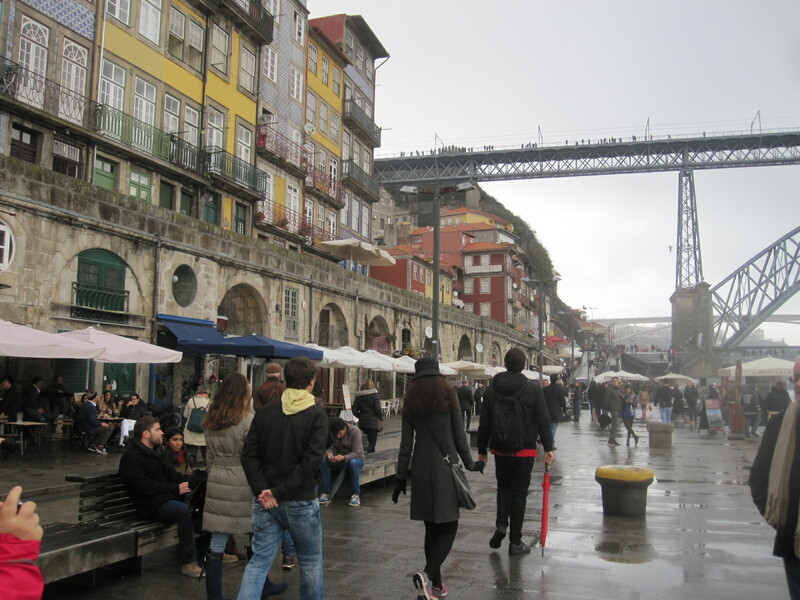 We proceeded past the waterfront area called Ribeira with its tall, brightly coloured buildings, shops and restaurants, although it was barely visible from the bus. 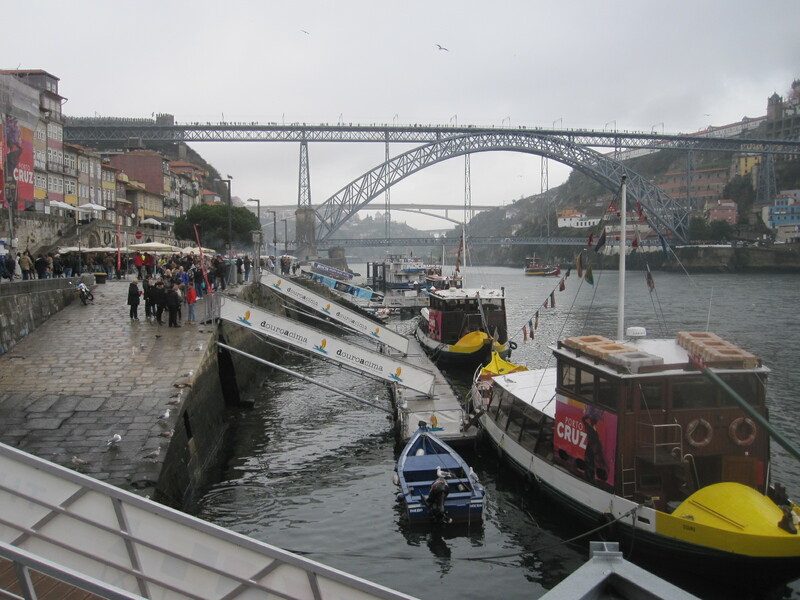 Then, looming up through the rain came the magnificent Ponte Dom Luis I iron bridge with its two decks, one just above the river and the other 60m higher, level with the streets further back in the town. 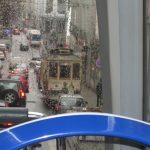 The lower deck is for normal traffic and the upper restricted to trams and pedestrians, although it is a wide road. 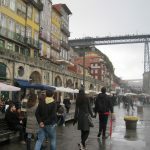 The bus turned on to the bridge and crossed the river to to Cais de Gaia, with its many wine lodges, before retracing its route for some distance and working its way back to the starting point in the city centre. walk up to the road that crosses the bridge on the higher level, but I chose to use the nearby funicular railway which runs alongside a length of the old city wall and was an experience in itself. The view from the top level was described in the guide book as ‘nerve-jangling’, but whoever wrote that must have nerves that were easily jangled, because it didn’t bother me at all, and I am very sensitive to heights. 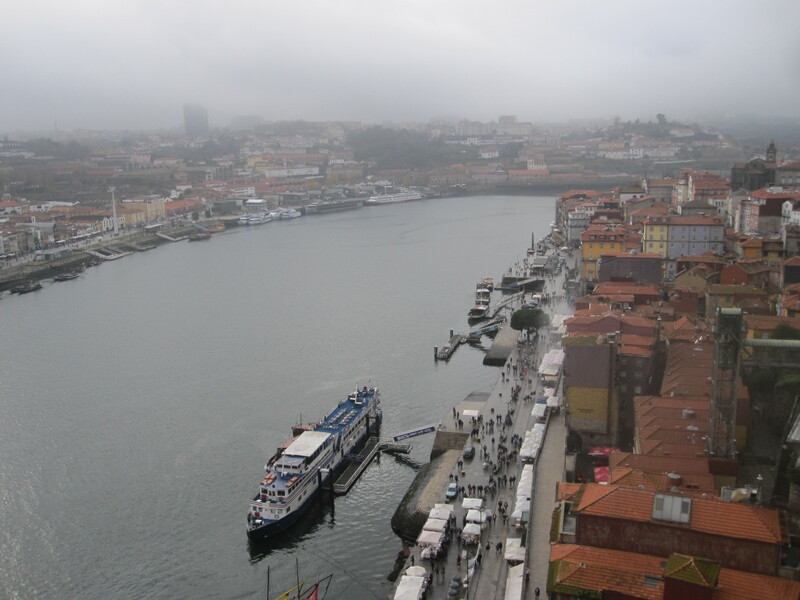 The view was fantastic, in one direction looking over the Ribeira waterfront and the other way towards another two imposing bridges. 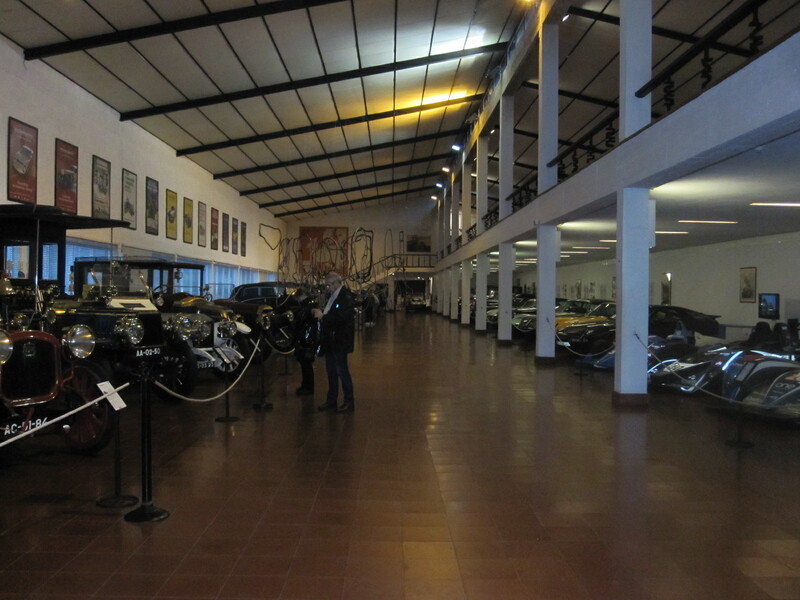 consisted entirely of a display of about 12 cars that had been the official vehicles of former Presidents of Portugal. It was reminder of how short a time it is since the country was a military dictatorship, and seemed to be intended partly as a political statement. It started in the 1960s with Rolls-Royce and Mercedes top-of-the-range limousines, and gradually worked down over the decades to fairly ordinary Mercedes, BMW and Audi saloons as the country became more democratic. The communications section was very strange. The main display was called COMUNICAR, and described in English as ‘based on an anthropological concept of Communication….’ and ‘attempts to convey the polysemic wealth of Communication, in its various forms.’ I understood the display about as well as I understood the description, and came out confused and bemused. 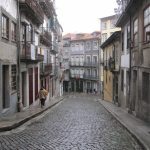 A walk through the steep cobbled streets of the old city brought me back to earth and it cannot be denied that Porto has a lot going for it as a tourist destination. Unfortunately due to the inclement weather I did not see it at its best. in sight. Sixt is a company that I have used several times before and have always found to be satisfactory, so I was concerned when I found after booking the car on the internet that there were a number of bad reviews of their Porto operation. The depot was quite smart, with pleasant staff, and the white Audi 1 had just been washed. I inspected it very thoroughly and made sure that the few minor defects were properly noted. 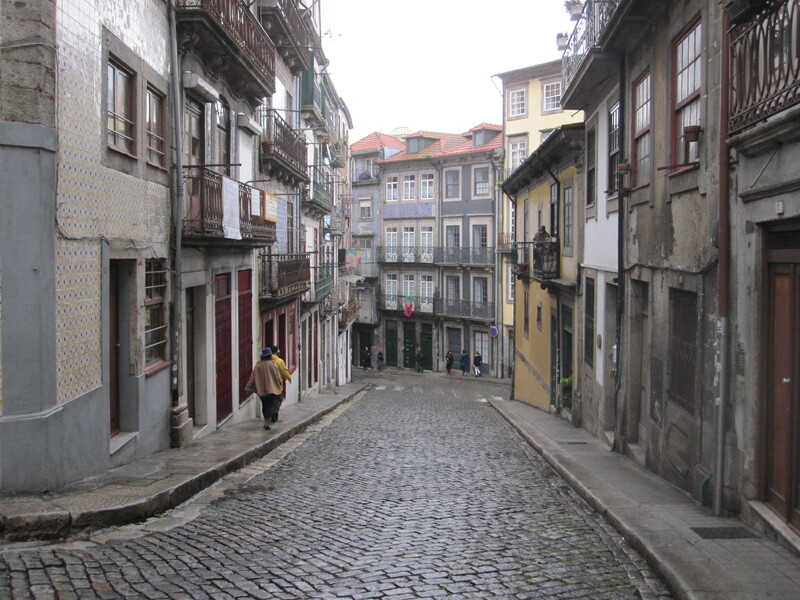 Taking over a strange car in the middle of a foreign city can be daunting, but in this case there was almost no traffic, and I set off to find the motorway towards Caramulo, a small town in a fairly remote hilly area about 70 miles south-east of Porto. 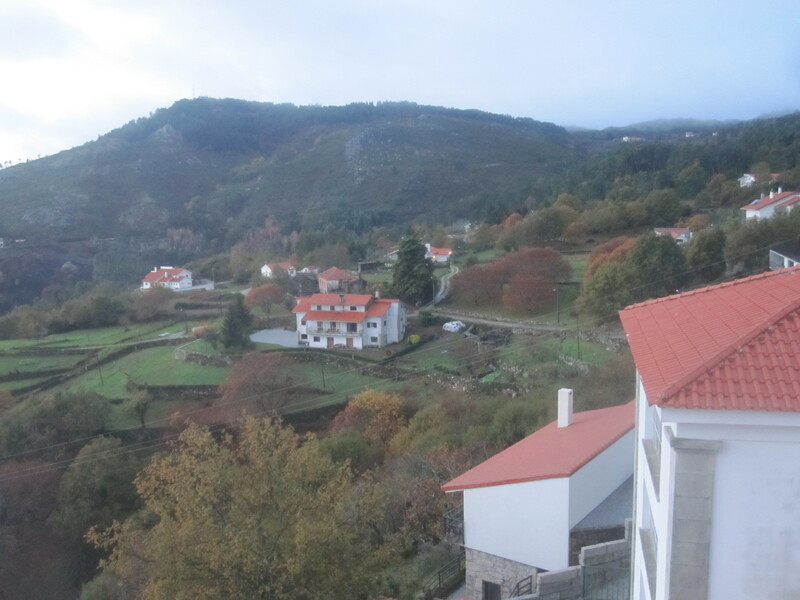 A couple of weeks before this trip I had bought a new TomTom satnav, despite which I had considerable difficulty in coping with the motorway network in the suburbs, but eventually found my way onto the A32 motorway to a place called Oliveira de Azemels. The motorway ended near there and according to the map the cross country route from this point to Caramulo was very complicated, via a series of relatively minor roads for about 45 miles. The alternative was to use the satnav, which would have taken me a longer way on main roads and another motorway, probably less interesting and scenic. Within a short time on the minor roads I found myself in about the most challenging stone-built village I have ever driven through, with improbably narrow roads and steep hills. Luckily there was no one coming the other way, and eventually I found a junction with road number 224 which was on the map. From here to Caramulo was as good a drive as I had hoped, although the rain set in and by the time I got there it was quite heavy. 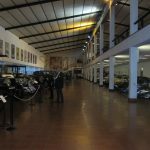 Caramulo is widely known in Portugal as a health resort and also for its museum, which is unusual in being partly dedicated to art and partly to old cars and motorcycles. The vehicle section was very good and well worth the effort to get there. By the time I came out the weather was dreadful and it appeared that a storm was on its way. I had booked a country guest house in a village called Jueus buried in the hills about 5 miles away. The whole area was very much like central Wales with narrow roads, sharp bends and sheer drops. Jueus appeared to be a community of isolated stone-built farms set back from the road, with no legible signs of any sort, and not surprisingly considering the weather, there was no one to ask. I pulled into a farm yard with three parked cars and lights all around, and after hammering on doors and doing my best to make my presence known I failed to make contact with anyone. By now it was starting to get dark, and it was dangerous to blunder about in those weather conditions so I went back to the museum and asked if there was a hotel in Caramulo. The people pointed across the road and said “There”. Facing the museum was a very large building with an empty car park, which turned out to be the Caramulo Congress Hotel and Spa. As far as I could see there were no other guests, but the staff did not seem surprised to see me and gave me a room on the second floor, which was in total darkness when I came out of the lift. The power was restored quite quickly, but went off again just as I was going to go down to the restaurant. In my bag I had a small LED torch and found my way to the stairs down to the lobby, as I did not care to use the lift, even if it was still working. The staff were totally unfazed by this situation and somehow produced an excellent meal. building. In the morning I went outside with some trepidation, expecting to find the car crushed under a tree, and was pleased to see that it was as I had left it. 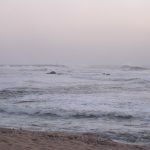 According to the hotel staff and TV news it was an exceptional storm, affecting the whole of southern Europe, and a lot of damage had been caused. 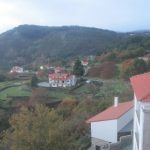 The plan for the day was to visit a museum at Ribeiräo, about 15 miles north of Porto and then stay at a hotel on the Atlantic coast. 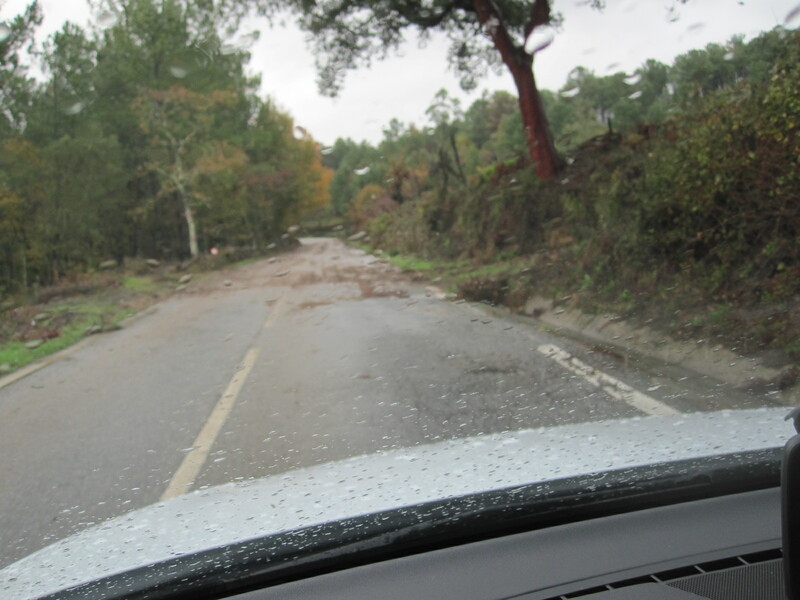 As soon as I got on to the road to the A25 motorway the effects of the storm were obvious, with branches all over the road and quantities of soil washed down from the adjacent land. 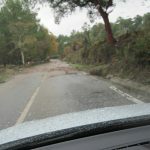 It looked as if some fallen trees had already been moved, which was quick work by the authorities. Because of this I decided to take the fastest route to Ribeiräo, mostly motorway with little traffic, and arrived just before midday. The area was industrial, and the museum was on a big trading estate associated with a place called Parc Lago Discount, and closed for two hours at lunchtime. The man in the gatehouse directed me to a restaurant which was like a huge greasy spoon café, full of men in working clothes. The menu consisted of soup, which appeared to be compulsory, and a choice of three main courses, all for €5. There was nothing in English, and the staff spoke very little English, but I got a passable meal. By the time I left there were about forty men in there and one woman. Before going back to the museum I had time to look round a vast warehouse called Casa China, full of Chinese products of all sorts. Somehow the whole place reminded me of Belgium. The museum was extremely good, with the friendly staff that are usually to be found in such places. Entry was free and it was apparently run as an educational establishment. They seemed to be short of money but were planning to expand. 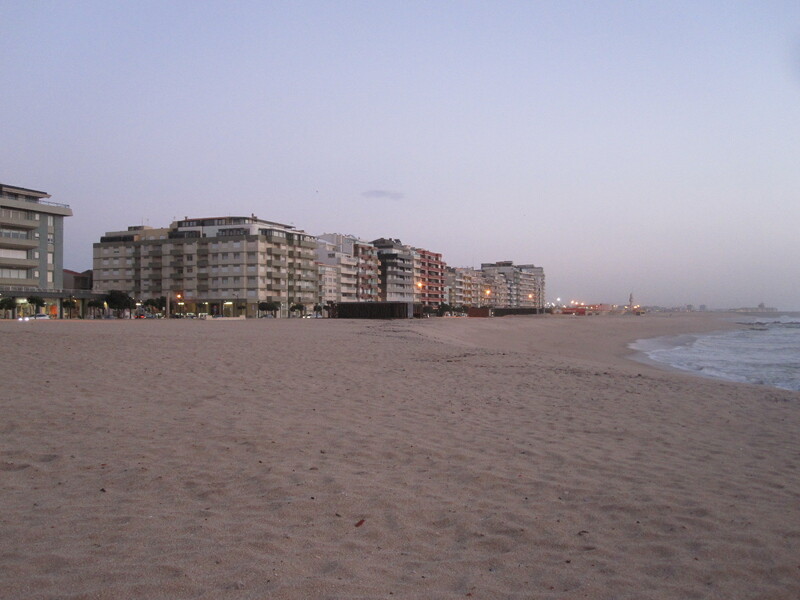 I had booked a hotel in a small town called Póvoa de Varzim on the coast 12 miles from Porto Airport, and arrived in time to walk to the beach before dark. 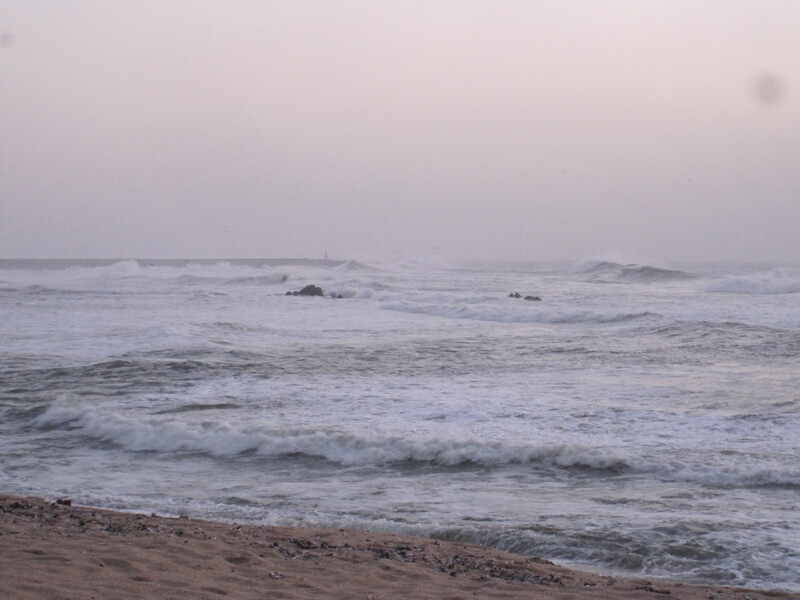 The first thing that struck me was the height of the waves, presumably a legacy of the storm, and this area is noted for good surfing conditions anyway. 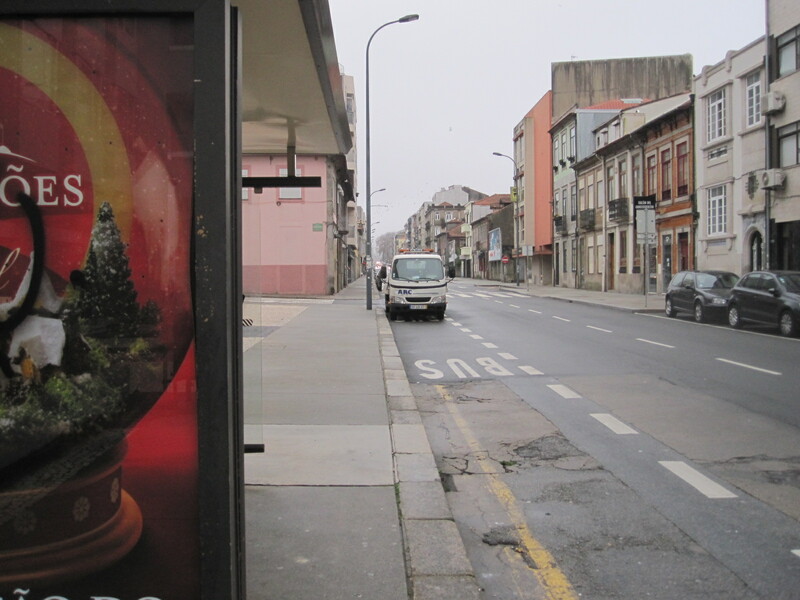 It was not the best time of day, time of year, or weather for seeing a seaside resort, but I got the impression that under the right circumstances Póvoa would be quite a pleasant place. Considering the state of the roads the car was surprisingly clean, but in view of what I had read about Sixt Porto I spent a few minutes in the hotel car park wiping off the dried mud around the sills and wheel arches. When I took the car in the next morning I was amazed to see the Sixt staff checking the undersides of the returned vehicles with mirrors on sticks, just like the border guards in the old Iron Curtain days. After two or three tense minutes my car was deemed to be in order, but this was an example of how car hire firms are tightening their procedures and looking for every possible reason to impose extra charges. 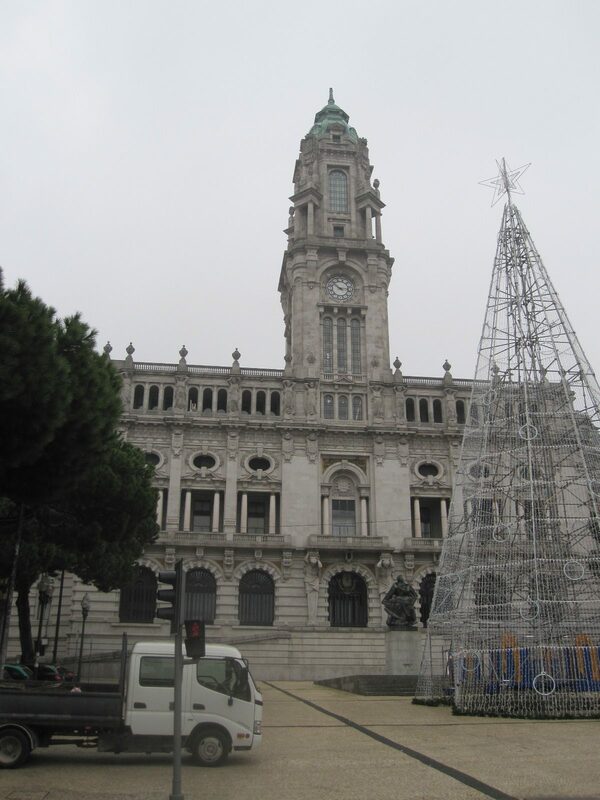 My visit to Portugal had been constrained by limited time and unexpectedly bad weather, although considering that it was December I suppose I should not have been too surprised. 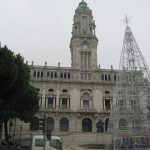 Apart from in a few places such as the Metro from the airport and the centre of Porto it was also notable that there were few people around and mostly not much traffic, certainly compared to South-east England. 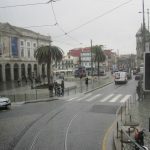 Portugal has a reputation for bad drivers, supported by a high accident rate, but I did not think it was worse than most other European countries.